Olamic Cutlery knives sport M390 or ELMAX blade steel on a caged bearing system for a supremely quick deployment using the flipper. 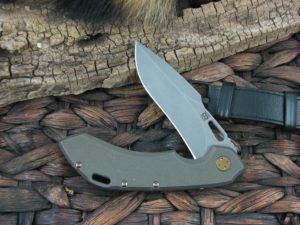 They have a well designed flipper tab as well as a thumb slot for a more traditional style opening method you can use when you need a silent blade deployment. The titanium frame lock, floating titanium backspacer and precise tolerances give the knife durability and strength throughout. The handle is made from 6Al4V titanium in a variation of finishes. They come with a ceramic ball pocket clip positioned for tip-up right-hand carry. 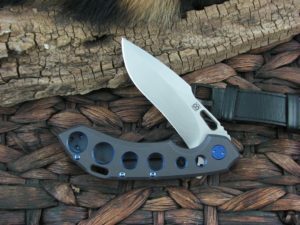 Custom quality at an affordable price makes these outstanding EDC knives for the discerning user. I am having troubles keeping supplied from Olamic. Thus it looks like this category will be ending soon.